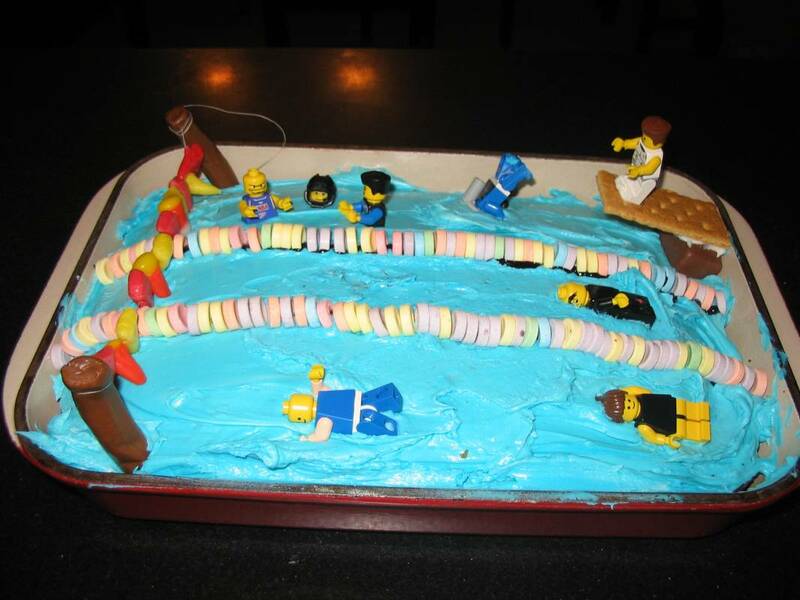 The lane lines are Smarties (which it turns out don’t taste good with cake and frosting), the diving board is a graham cracker on a fun-size Snickers base. The droopy things on the left are supposed to be flags suspended over the pool, but the Starburst and candy-corn flags were too heavy for the Tootsie Roll supports! The Lego figures were created by Max and Ben, who came up with the genius idea of having partial figures to represent partially submerged swimmers. That's awesome :) I could tell what the candy corn was supposed to be... it is tough to suspend stuff like that, though. I love the partial people in and out of the water - great effect! Very Cool. Happy Birthday Nat!! Hey! November 15th is my birthday too. Happy birthday to the both of us! Also born on this day: Ed Asner and Petula Clark (the 1961 pop hit "Downtown"). And the XBox! In point of fact, November 15th is considered "the last day a product can be in stores to be considered 'available for the Christmas shopping season'." So, every year, tons of new products officially ship on November 15th. Haha that cake is AWESOME!!! Im a swimmer also. thats soo cool. I like making my cakes for my birthday, can i have the directions on making it. My birthday this year happens to fall on the night of our County meet... the team could eat it afterwards. OMG! Wow! this cake is soooo great! May I have the directions to make it? wow i love this cake im going to make it for my 13th birthday party in 28 days. i have been on swimteam for 7 years (this upcoming year to be my 8th)AWESOME CAKE! !